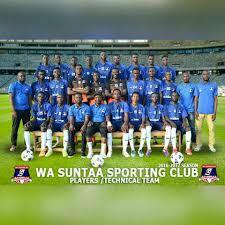 Newly promoted Division One side, Wa Suntaa SC, have set December 27, 2017 as the date for their preseason program ahead of their debut season in the second tier. The Wa based side eased their way to the National Division One league with an unbeaten 15 game run in the upper west before adding the Wa Naa Cup to their trophy cabinet. Wa Suntaa SC, known in the sporting fraternity as We Believe, are set to kick off their off season program in the upper west region after a long break. The Believe Boys will launch their preseason program in Wa before heading to the Northern and Brong Ahafo regions later in the program ahead of the first season in the second tier. Managed by Abdul Aziz Kandomah John, the Believe Boys are unbeaten in 19 consecutive games, ending the whole of 2017 without a single competitive defeat. To put the picture into the perspective, the newly promoted side have actually lost twice in 39 games including friendly matches. Their 15 wins, 2 drawn games and 2 defeats in the 19 friendly ties was followed by 15 wins and 4 drawn games in the 19 other competitive fixtures. Set to compete in the na hectic and uncompromising league and zone, the Believe Boys at set to direct some media limelight in the coming months. Can they ease their way to the upper echelons of Ghana football? December 20, 2017 in Sports.